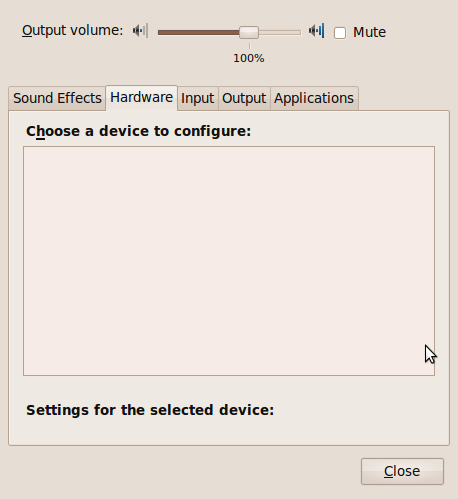 In Sound Preferences -> Hardware, there is no audio device listed. So there's no audio to be heard, yet apps think they are playing okay. If I kill off pulse audio plays fine (tested with mplayer and an mp3), if I use sudo mplayer it also plays (even when pulse is loaded). Is this reproducible using the ubuntu-audio-dev PPA? ** Attachment added: "Screenshot-Sound Preferences.png"
Yes. I added that PPA after your message, dist-upgraded and got a load of expected new packages. After reboot I still have no sound. > of expected new packages. After reboot I still have no sound. Sorry, should I expect something to happen after issuing that command? I'm not familiar with it. > Sorry, should I expect something to happen after issuing that command? > I'm not familiar with it. After you pass trigger, see if your audio device/s is/are now listed. Sadly not. Still no hardware showing up. > Sadly not. Still no hardware showing up. Please attach the log to this bug report. useful. At least slmodemd is known to monopolize the device. Purged sl-modem-daemon, restarted pulse and all is now funky. Thanks so much for the awesome turnaround time on that!